What Is the Difference Between Real UGG Boots & Fake UGG Boots? Mini UGGs: real or fake? 3 What Are Moon Boots? Ever since UGG Australia boots became popular in the early 2000s, numerous companies have copied the successful style, with a few minor differences, to prevent copyright lawsuits. The real boots are made of sheepskin and lined with fleece, which keeps feet warm in freezing winter temperatures. Fake UGG boots are made with other products, such as leather, fur or synthetic materials. Real UGG Australia boots will always have the company logo printed on a square label, which is then sewn onto the back of the boot at the heel. Companies that market similar sheepskin boots have names such as Real Australia or Emu Australia and place their company name in the same place to fool the consumer. The real UGG Australia boots have the logo and a blazing sun printed on their rubber soles. Without these prints, the boot is considered fake. Most UGG Australia boots have gentle ridges carved in the soles to promote better traction. The taller UGG Australia boots, as well as a few of the lace up styles, have well-defined traction on the soles and still include the logo with the sun. Real women's UGG Australia boots can be found on the official website starting at around $140.00. Boots of similar design that are selling for less are fake. These boots are normally manufactured in China in order to reduce costs. 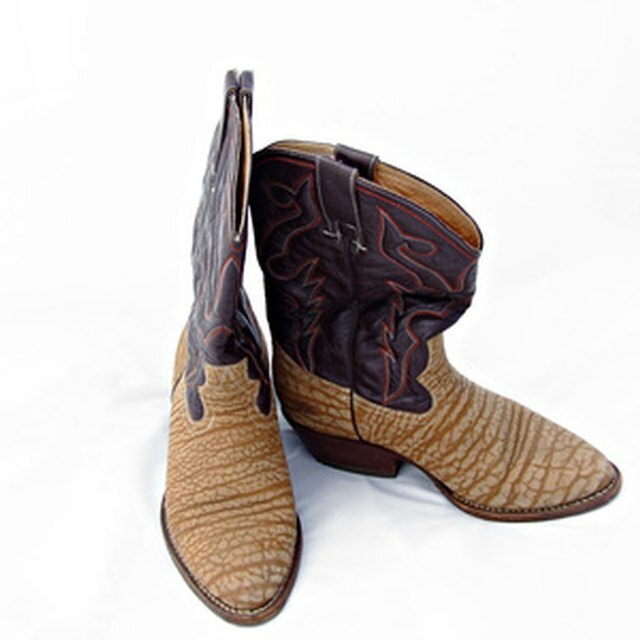 Fake boots can be constructed of synthetic materials instead of sheepskin. Sheepskin is expensive, which drives up the cost of real UGG Australia boots. Real sheepskin boots will outlast the fake synthetic fiber boots. The most popular styles of real UGG Australia boots are Classic Short or Classic Tall, boots without laces or zippers that feet just slip into. The Classic Short, at around seven inches tall, comes up just above the ankle. The Classic Tall, at around 12 inches tall, comes up just below the knee. Any other height of boot would be fake. UGG Australia boots are made in a limited number of solid colors and patters. Most UGG Australia boots are sold in solid colors, such as black, tan and grey. The company most recently came out with a few colorful and metallic patterns, with names such as Fancy or Floral, but any other boot with heavy printing is fake.